Such a baby. Try not being a weasel and maybe you’ll get called on. 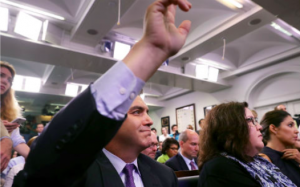 CNN reporter Jim Acosta expressed frustration on Monday after White House press secretary Sarah Huckabee Sanders did not call on him at that day’s press briefing. During the White House press briefing on Monday, Acosta attempted to ask Huckabee Sanders multiple questions, but she did not give him the opportunity to speak, calling on other reports instead. “Gosh it’s so bizarre how @PressSec keeps avoiding questions from CNN. #cantstandtheheat,” Acosta tweeted afterward.